As an exciting, culturally-happening place, Berlin is the ideal location to host your special day. When it comes to saying “I do” in this German metropolis, however, it’s not as easy as you’d think. In fact, Germany as a whole is a particularly complicated place to tie the knot in thanks to a complex bureaucracy. In Germany, it’s necessary for couples to get married at a civil registry office if they want their marriage to be recognized as legal. This shouldn’t be too complicated—except that these appointments are nearly impossible to get, especially if you have a specific date in mind. 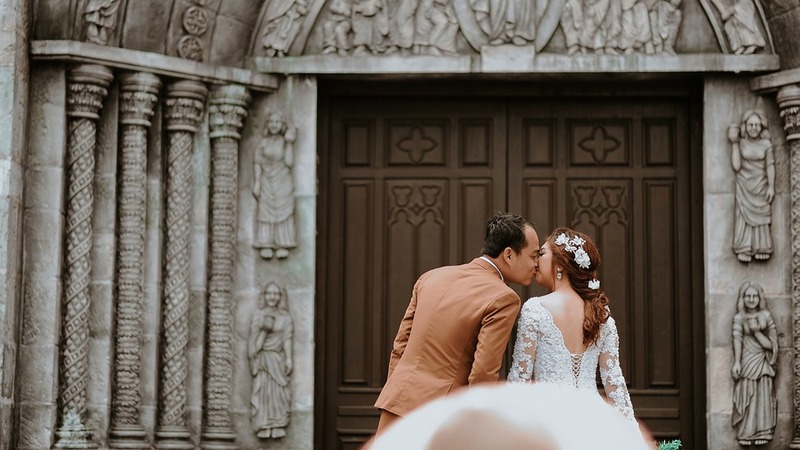 While many couples opt only for a civil ceremony, you can always host the celebration or traditional wedding of your dreams after the ceremony in one of the city’s venues. So how does one actually get married in this system hyper-focused on the right paperwork and process? This guide will show you not only how to get married, but also where to celebrate afterward if you’re looking for something a little less governmental for your big day. If you or your partner is not German-born the marriage process can seem particularly daunting since there’s more than a mountain of paperwork and waiting. Unlike other countries around the globe, you are unable to get married on short notice in Germany (in most cases), and there are even reports of brawls over wedding appointments. The best way to ease the tension is to start the process early. The Berlin registry is always overwhelmed with applicants, especially during peak wedding season (May to October). You can start as much as a year in advance with planning, especially if there’s a busy date you want to book for your wedding. First, book an appointment at your citizen's registration office. This will help you get the list of documents you’ll need to get married, which is especially vital if you’re not both German citizens. Then, begin requesting all documents from abroad, as needed, and send them to your embassy. This can take up to 3 weeks to be processed. Finally, only when you have all your documents, book an appointment at your registry office to bring all the papers. If you need an interpreter, you’ll have to bring one with you. As soon as your application has been approved, you’re able to get married. This means it’s time to actually book that wedding date. These can only be booked up to 2 months in advance, and competition is fierce. Both parties will need to be present for the last appointment when you get the details for the ceremony and set a date. The civil ceremony is hosted in wedding rooms in local magistrate offices. These are some of the nicer rooms, though they take great pains to avoid any religious references. Depending on the magistrate office you choose, these can be quite beautiful spaces that are perfect for your big day. While many couples choose to only proceed with the civil wedding, many have grander ideas of their own wedding days and opt for a traditional ceremony. These ceremonies are always welcome, but they must be done after the civil ceremony in order to be considered valid. While a casual wedding dress for courthouse nuptials is all you need if you opt for a civil ceremony alone, you can go as extravagant as you want if you decide to keep the celebration going. Like when planning your civil wedding, you’ll also want to start this process in advance. Planning any wedding takes time. From landing free shipping on thigh high stockings for the bride to securing the perfect caterer, it’s a lot of work to make your dream a reality. There are many stunning places to host your traditional ceremony and party in Berlin, but many of these fill up quickly, so finding your ideal dates can be a challenge. Hotel De Rome - In Berlin’s Mitte, this is the definition of luxury with a rooftop bar and opera court. Gut Wendgraben - Known as a slice of Tuscany in Berlin, this venue is hidden in Brandenburg an der Havel. Seelodge - If white sand beaches are your thing, SeeLodge has the best beach, pier, and private island in the Berlin area. The Lakeside Burghotel - With a great hall that looks like it’s from the Middle Ages, this is the most romantic spot in Berlin. Getting married in Berlin doesn’t have to be complicated. The key is to start the process early as you prepare for your big day. Like many things, Germans like to take this process one step at a time. If you’d rather elope, it might be worth the flight to Los Vegas. If you’ve been dreaming of a picture-perfect Berlin wedding, then your dream might just be a few months (and a lot of paperwork!) away.